The Norbar PT-72 Series gearbox diameter allows these Powered Torque Multipliers superior access for torques up to 2000 Nm, with a switchable forward and reverse operation. 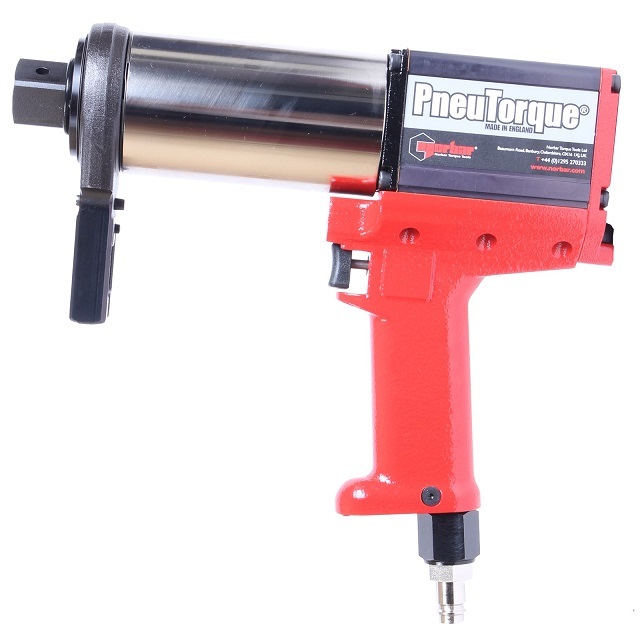 Quiet and non-impacting, the PT-72 series of Powered Torque Multipliers promote low operator fatigue and feature a “soft start” trigger control which assists with socket location and allows for a gradual and safe reaction take up. Remote Control versions of the PT72 have no direction shut-off control on the tool itself but rely on external pneumatic circuitry to provide this function. This opens up numerous application possibilities for the PneuTorque ranging from simple stall shut-off in a hazardous working environment to sophisticated, multi-spindle torque and angle shut-off systems. Capable of reaching torque values up to 2000 N m.
Quiet – less than 82 dB(A), and low impacting. Gearbox can turn independently from the handle. Torque reaction is never transmitted back to the operator. Automatic Two Speed Models available allowing for run down speeds five times greater than the final torque speed. All models available as Remote control versions. Each gearbox is supplied with a standard reaction device. Engineered to Order reaction accessories are also available. *Angle Encoders are available for PT 72mm series. Part No. 60155.